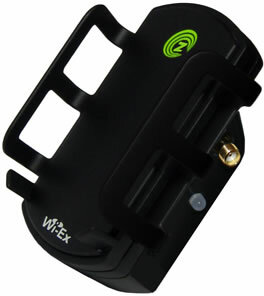 The YX240 zBoost z-Force is brand new in-car amplifier by Wi-Ex (Wireless Extenders). Similar to the Wilson Sleek, the z-Force is an integrated cradle amplifier. This means that the cell phone amplifier is integrated into a cradle unit which holds and charges your cell phone. You can then use your in-car hands-free kit or BlueTooth options to make and receive calls. By having the phone so close to the amplifying unit you can get great signal increases, without having to worry about the unit powering down because of feedback. The zBoost z-Force is easy to install and can be set-up in minutes. Step 1. Position zBoost Ampli?er Cradle. With the standard kit the cradle is mounted to the dash using the included Velcro strip. 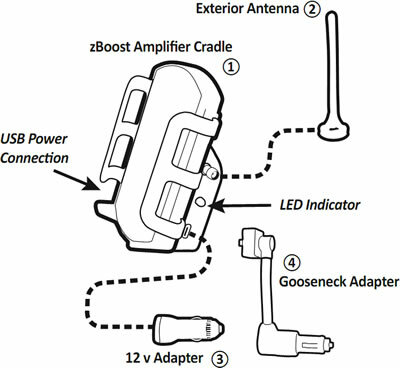 With the optional Gooseneck adapter the cradle attatches directly to the in-car cigarette power supply via a flexible neck. NOTE: The left side of the z-Force Cradle features a USB power connection so that you can charge your cell phone while using this product. Step 4. Check the LED is green and your unit is functioning!